Thrombosis of mechanical prosthetic valve prosthesis in pregnancy is a challenging situation. Here, we present a case who has large thrombus on her prosthetic aortic valve. A 40-year-old female with prosthesis aortic valve had developed shortness of breath and consulted to our clinic on the 1st postpartum day. An elective cesarean delivery with spinal anesthesia was performed at the 37th week of pregnancy of her first child. She had a history of Bentall operation before 16 years ago and had a bileaflet mechanical prosthetic valve (27 mm, St. Jude Medical, Inc., MN, USA). She had no other cardiac risk factors such as hypertension, diabetes, or dyslipidemia. After the detection of pregnancy, her warfarin treatment had switched to enoxaparin 6000 IU subcutaneously for twice a day, continued throughout the pregnancy. Her weight was 62 kg. She did not have any blood test for factor Xa. Due to the patient referred from the outer health center, there were no other follow-up data or transthoracic echocardiogram report during pregnancy. Her dyspnea was worsened in the last week. On physical examination, she has orthopnea, tachypnea (24/min), tachycardia (128 bpm), and hypotension (85/55 mmHg). Bilateral lungs were normal on auscultation. No clinical evidence of deep vein thrombosis was present. Other physical examination findings were normal. Electrocardiogram was uneventful with sinus tachycardia of 128 bpm with normal axis. Echocardiography revealed normal left ventricle size with left ventricle hypertrophy, ejection fraction of 60%, reduced motion of prosthetic valve leaflets, and an obstructing mass between the struts. Pulmonary artery pressure was 25 mmHg. Doppler ultrasonography showed that prosthetic aortic valve has a pressure gradient of 104/59 mmHg. These findings were consistent with prosthetic thrombosis. Moderate aortic regurgitation into the left ventricle was also detected. The international normalized ratio (INR) at admission was 1.02 and hemoglobin was 11.2 gr/dL. 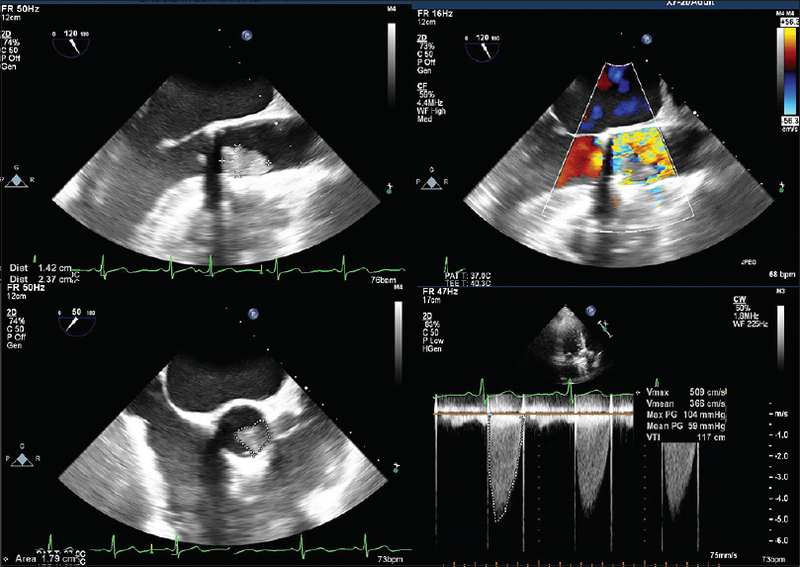 Transesophageal echocardiography showed 1.4 cm × 2.3 cm thrombotic material located over leaflets and adjacent to the posterior aortic wall [Video 1] and [Figure 1]. It was restricting the valve motion. The patient underwent emergency operation immediately. The thrombotic material over mechanical valve was extracted, and there was no pathology seen on mechanical valve, graft repaired primarily. Postoperative recovery was fine. Thrombotic material was sent for microbiological examination. No bacteria were detected both direct microscopy and culture. The patient was a young female with no cardiac risk factors for thrombosis. Long-term enoxaparin medication throughout the pregnancy was chosen for anticoagulation for her prosthetic aortic valve. Despite enoxaparin dose was adequate for her weight, anti-Xa levels were not monitored. The effectiveness of low-molecular-weight heparin (LMWH) did not ensure and thrombosis occurred. We could not describe when thrombus was exactly grow. After delivery with cesarean section, volume depletion has occurred. Her symptoms related to obstructive thrombosis were exacerbated. Prosthetic valve thrombosis is the most serious thromboembolic complication with high mortality. The bileaflet mechanical, St. Jude Medical, valve prosthesis has a very low complication rate with a thrombosis rate of 0.03% per patient a year., The two leaflet pivots of this prosthesis are designed within a “butterfly” recessed in the orifice ring without fixed pivot points. This allows rapid, controlled movement of the leaflets with reduced possibility of thrombus formation. Velocity and turbulent shear stress studies of this mechanical valve prosthesis found that the region adjacent to the pivot mechanism has a combination of high turbulent shear stresses and flow separation. Nevertheless, larger valve size seems to be a risk factor for the late thromboembolic event. Patients with mechanical heart valve prosthesis should have lifelong anticoagulant drugs to reduce thromboembolic complications. Pregnancy can promote thrombosis of mechanical heart valve prosthesis and embolic events. Hence, effective anticoagulation is obligatory. Vitamin K antagonists (VKA) and unfractionated heparin (UFH)/LMWH have potential side effects. VKA not only has protective effects for prosthetic valve and embolism but also has teratogen for the fetus. UFH/LMWH were safer for the fetus; however, there were some concerns for prosthetic valve and thromboembolism. Optimal therapy regimen is not well defined; some therapeutic options were defined. At the first trimester, dose adjusted LMWH or dose UFH can be used. VKAs are associated with embryopathy, spontaneous abortion, premature birth, fetal bleeding, and fetal death at the first trimester. Negative effects of warfarin to the fetus seem like dose dependent., Although it is known that the patients who require ≤5 mg/day warfarin (or acenocoumarol <2 mg/day, phenprocoumon <3 mg/day) could be used, recent studies concerning the safety of low-dose warfarin are controversial. On the other hand, LMWH and UFH do not cross the placenta; therefore, substitution of VKA with UFH or LMWH in weeks 6–12 almost eliminates the risk of embryopathy. In the second and third trimester, VKA therapy can be used. In peripartum period, LMWH or UFH should be used. Vaginal delivery while the mother is on VKA is contraindicated because of the risk of fetal intracranial bleeding. Despite all three regimens have hemorrhagic complications, the incidence is lower with VKAs. In the present case, the patient used enoxaparin throughout the pregnancy. Although this was an acceptable option in former studies, it is now advised to switch LMWH/UFH therapy to VKA after the first trimester because of the risk of prosthesis valve thrombosis. If LMWH was chosen for anticoagulation in the patient with prosthetic heart valve and pregnancy, plasma anti-Xa levels should be higher than 0.6 IU/ml before the next dose of LWMH. After 4–6 h of injection, anti-Xa levels should be in the range of 1.0–1.2 U/ml for mitral and right-sided valves or in the range of 0.8–1.2 U/ml for aortic valves. This regimen should not be used if anti-Xa levels could not be monitored. In our patient, unfortunately, LMWH activity did not monitor with anti-Xa levels. The management of mechanical prosthetic valve thrombosis is high risk, whatever the option is taken. Anticoagulation, fibrinolysis, or emergency surgery can be chosen. Obstructive prosthetic valve thrombosis in critically ill patients without a contraindication to surgery should undergo emergency valve replacement. Fibrinolysis may be considered if the surgery is at high risk but carries a risk of bleeding and thromboembolism. If the patient is not critically ill and has a history for inadequate anticoagulation, an intravenous UFH plus aspirin can be administrated before emergency surgery or fibrinolysis decision. In nonobstructive thrombus, if thromboembolism exists with thrombus larger than 10 mm, surgery or fibrinolysis should be performed. The patients with smaller thrombus should receive anticoagulant therapy. Persistence of smaller thrombus with a second thromboembolism should be managed with surgery or fibrinolysis. If thromboembolism not exists, large thrombus (>10 mm) which resistant to anticoagulation should receive surgery/fibrinolysis. Small thrombus should receive anticoagulant therapy and follow-up unless the patient has thromboembolism. Management of mechanical valve thrombosis in pregnancy is a more challenging situation. A team comprising a cardiologist, cardiovascular surgeon, obstetrician, and perinatologist should decide which strategy is the best for the patient. This case illustrates the need for closer monitoring of the anticoagulation treatment in patients with large-size prostheses after the replacement of the aortic valve, even if the mechanical valve was uneventful for many years. In case of suspected valve thrombosis, early diagnosis is recommended, and emergency operation is indicated in patients with critical condition. Fernandez J, Laub GW, Adkins MS, Anderson WA, Chen C, Bailey BM, et al. Early and late-phase events after valve replacement with the St. Jude medical prosthesis in 1200 patients. J Thorac Cardiovasc Surg 1994;107:394-406. Burckhardt D, Striebel D, Vogt S, Hoffmann A, Roth J, Weiss P, et al. Heart valve replacement with St. Jude medical valve prosthesis. Long-term experience in 743 patients in Switzerland. Circulation 1988;78:I18-24. Smith JA, Westlake GW, Mullerworth MH, Skillington PD, Tatoulis J. Excellent long-term results of cardiac valve replacement with the St. Jude medical valve prosthesis. Circulation 1993;88:II49-54. Arom KV, Nicoloff DM, Kersten TE, Northrup WF 3rd, Lindsay WG. Six years of experience with the St. Jude medical valvular prosthesis. Circulation 1985;72:II153-8. Yoganathan AP, Wick TM, Reul H. Influence of flow characteristics of prosthetic valves on thrombus formation. In: Butchart EG, Bodnar E, editors. Thrombosis, Embolism, and Bleeding. London: ICR Publishers; 1992. p. 123-48. Chan WS, Anand S, Ginsberg JS. Anticoagulation of pregnant women with mechanical heart valves: A systematic review of the literature. Arch Intern Med 2000;160:191-6. Anderson GD. Pregnancy-induced changes in pharmacokinetics: A mechanistic-based approach. Clin Pharmacokinet 2005;44:989-1008. Hassouna A, Allam H. Limited dose warfarin throughout pregnancy in patients with mechanical heart valve prosthesis: A meta-analysis. Interact Cardiovasc Thorac Surg 2014;18:797-806. Xu Z, Fan J, Luo X, Zhang WB, Ma J, Lin YB, et al. Anticoagulation regimens during pregnancy in patients with mechanical heart valves: A systematic review and meta-analysis. Can J Cardiol 2016;32:1248.e1-9. Baumgartner H, Falk V, Bax JJ, De Bonis M, Hamm C, Holm PJ, et al. 2017 ESC/EACTS guidelines for the management of valvular heart disease. Eur Heart J 2017;38:2739-91. Regitz-Zagrosek V, Roos-Hesselink JW, Bauersachs J, Blomström-Lundqvist C, Cífková R, De Bonis M, et al. 2018 ESC guidelines for the management of cardiovascular diseases during pregnancy. Eur Heart J 2018;39:3165-241.
van Driel D, Wesseling J, Sauer PJ, Touwen BC, van der Veer E, Heymans HS, et al. Teratogen update: Fetal effects after in utero exposure to coumarins overview of cases, follow-up findings, and pathogenesis. Teratology 2002;66:127-40.